As Chair of Trustees it is often difficult to find a topic for my section of the newsletter that doesn’t simply repeat the success stories that Marcia can share with you. On this occasion, however, I want to share a success story that is only indirectly ours. In the last summer term I visited Tyler’s Green School in Buckinghamshire, where we have run a number of parent helper courses for parents to help their children read at home. 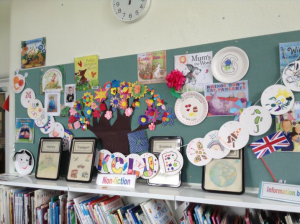 The parents at that school have become so involved in this process that they have set up a Book club at the school for the children in the library, and made this room a wonderful space as a result (see photo below). It was heartening for me to see their initiative, energy and enthusiasm, evidencing the continued impact of the service that ABC to Read provides. That has to be our eventual aim. To significantly change the way our service recipients look at reading, making it a lifestyle choice rather than something that is restricted to school time. We hope you have all had a wonderful start to the academic year, please do not hesitate to contact your fieldworker if you have any concerns that you wish to discuss. As you are now all aware, we are currently facing some uncertainty due to Reading Borough Council having to make cuts. They are currently in consultation about the possible closure of Bridge Hall as well as other community buildings. We are working very hard at finding alternate offices to work from as well as considering the storage space we need along with easy access and low rental costs and will update you as soon as we have further information. We have had a few viewings and one of them is looking to be a good potential option. Before we make plans to move offices we are having a good clear out of all our books and games as we anticipate having less storage space than we currently have. If you have any books that you do not use and are in a “tatty” condition or have games with items missing, could you please throw them away rather than bring them back to the book exchanges. It was wonderful to read the School evaluation results showing the impact that you are all having in our schools. We are looking at the way we evaluate your work and adapting the current form that we ask schools to complete as we are aware that the form can be quite an addition to their already heavy workload. As so many schools appear to be having staff changes of late, it would be advisable to take in your DBS form on your next visit as schools have a right to ask to see your DBS forms, ensuring that they are Ofsted proof! We have recently had to add some items into our safeguarding policy and into our new volunteer training programme making you aware of children that can be affected by Child Sexual Exploitation and Female Genital Mutilation. The notes covering the initial training are available for you to read on our website under Safeguarding as well as any emergency contact details. Once again, thank you to those of you who have helped out with recruitment fairs, presentations, coffee mornings and general networking. If you would like to be considered in assisting the charity with events such as these then please advise your fieldworker or contact Marcia. The coffee mornings that you are arranging amongst yourselves are proving to be a real success and, in turn, prevent you from feeling isolated in your roles. I am so pleased to announce that we won Mars in the Community Award, this award not only generated a donation towards the charity but it also means we can work in partnership with Mars this year to support more children with their reading around the Slough area. Thank you to Irene and Pauline for going along for the final presentation and question and answer round. It is with great pleasure that I can also let you know that we came 2nd place for ‘Best Group’ in the Slough Voluntary Sector Awards. Please help us with our fundraising by completing forms in your local Waitrose, Morrisons, Asda etc. to help us to be selected for a token drop. These can often lead to quite a few pounds towards our running costs. Time does not allow us to get to all the groups we would like to, however, if any volunteer wishes to speak at a group they attend we would be happy to provide them with supporting literature. Of course, you don’t have to speak to a large group to help us recruit – just talking to friends/neighbours about ABC to read and the rewards of volunteering can help find new reading helpers. We know our volunteers are the best possible ambassadors and we still have many vacancies to fill within schools. Please also remember, if you haven’t already done so, to check with your school as to the date you should return to your volunteering session after the Christmas break. We hope to see lots of you at our Christmas coffee morning on 15th December. If you haven’t already done so, please let us know if you are planning on coming along as we need to confirm numbers with the venue as soon as possible. If we are not able to see you at the Christmas coffee morning then we wish you all a wonderful Christmas and look forward to seeing you again next term!